The "Hi-Fi... for your dancing pleasure" violator on the cover is glued down on the left side, so that you can lift the paper to see the artwork underneath. I'm not sure if this paper was applied at the factory or, perhaps, at a record store to denote the LP as a "demonstrator". From the back cover: Edmundo Ros was born in the capital of Venezuela, Caracas, on 7th December, 1910. His mother was Venezuelan, his father Scottish-Canadian, and Edmundo was the eldest in a family of four children. His childhood days were happy and uneventful; he possessed a considerable scholastic aptitude, and displayed a keen interest in music from an early age, although no one at the time realized how great an influence it was to exert on his future life and vocation. His parents originally intended him to study for the legal profession, but is was eventually decided that he should embark on a career in the Venezuelan Army, and, with the object in mind, Edmundo entered a military academy. He was not particularly enamoured with his foretaste of army life, and lost no time in joining the academy's military band as a percussionist, deriving as much pleasure and satisfaction from this activity as he did from his studies. Edmundo remained in the academy for 3 1/2 years, and then faced the final choice of taking a commission in the Venezuelan Army or concentrating on music exclusively. He experienced no difficulty in making his decision, and within a short time had secured the post of timpanist with the Venezuelan State Symphony Orchestra. This position proved ideal for Edmundo, guaranteeing him a regular income and considerable opportunity for pursuing his musical studies. He joined the Venezuelan Musicians' Union, and rose to become a member of its committee. Before entering the military academy, Edmundo had won a State scholarship but had not availed himself of its advantages; now the idea occurred to him that he might utilize its financial benefits by journeying to London to study at the Royal Academy of Music. He sought and gained the permission of the scholarship authorities, and embarked on the outset of his momentous career in Europe. The terms of the scholarship grant were insufficient for Edmundo to live in London without another source of income, and soon after his arrival he teamed up with Don Marino Barreto, the pioneer Latin-American bandleader in Britain. Their object was to present authentic Latin-American music, but they encounter numerous initial difficulties and setbacks. It was not until the Barreto band, with its nucleus of South American musicians, was booked into the Embassy Club that success and recognition came its way. Engagements increased, but Edmundo persisted with his Royal Academy studies as well as singing and drumming with the band. In 1940, when his Barreto contract expired, Edmundo decided to form his own group, and the Ros band played its first engagement on August 8th of that year at the Cosmo Club in Wardour Street. This club had also been designated as an air-raid shelter, and it was not long before the local population flocked down regularly to the luxurious basement with its exotic music – whether an air-raid was in progress of not! The management was unable to cope with this situation for long, and Edmundo and his group moved on to the St. Regis in Cork Street, Piccadilly. 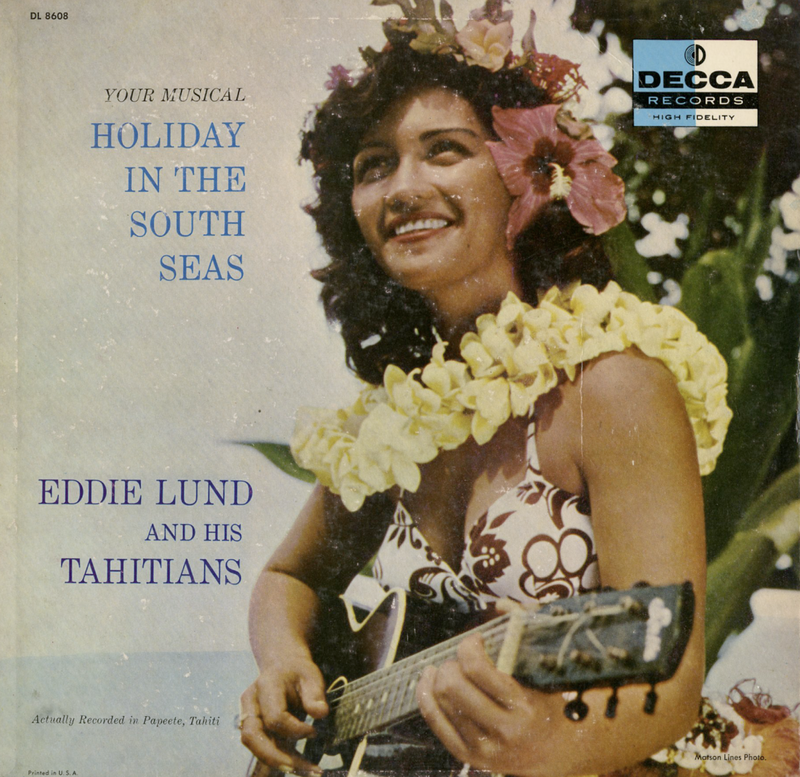 This booking was abruptly terminated two weeks later by the descent of a German bomb, but, despite these adversities, Edmundo maintained his efforts to introduce and popularize the music of South America and the Caribbean in Britain. His unflagging zeal and industry were rewarded when he commenced a long association with such famous West End nightspots as the Coconut Grove, the Bagatelle and the Astor – as association which was lucrative but extremely arduous. 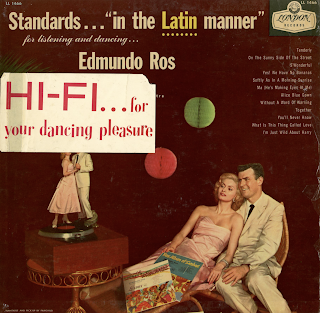 With characteristic astuteness and foresight, Edmundo soon realized that the music which he presented would have to be modified if it was to attract and maintain the interest of the general public; authentic arrangements were successful enough as far as the West End clientele were concerned, but he wished his music and ideas to spread and find favor beyond the limits of the night-clubs and restaurants. 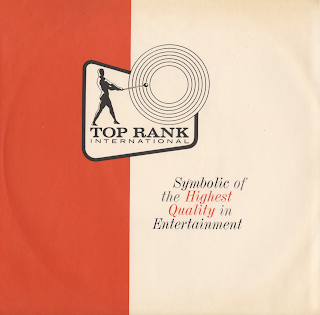 So he devised the formula which has proved so successful in achieving its purpose; a subtle amalgam of authentic rhythm and commercial arranging which appeals to all but the most die-hard aficionado and purist. The success of his broadcasts and records amply justified his policy, and proved beyond doubt to Edmundo where his future lay. He somewhat reluctantly concluded his Academy studies, devoting all his energy and concentration to his chosen task, and today finds him the affable proprietor of the popular Edmundo Ros Club (formerly the Coconut Grove) in the heart of the West End, where he and his orchestra are the star attractions. 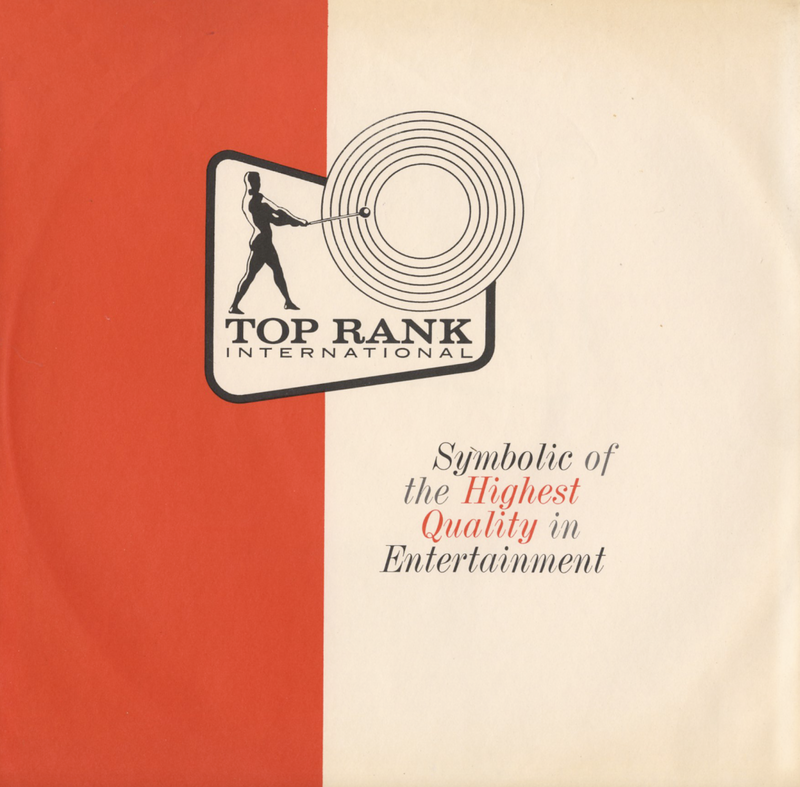 From Billboard - October 20, 1956: Edmundo Ros applies a novel treatment to a group of pop standards – wrapping them up "in the Latin manner." 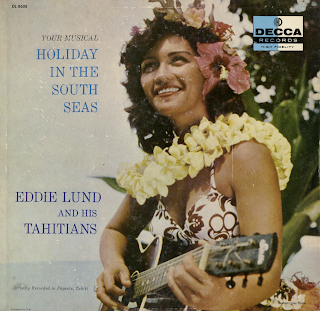 Not all of the tropical conversions are successful ("Alice Blue Gowns," for instance, seems out of its element), but the idea, over-all, is a most provocative one. An exuberant guaracha version of "You'll Never Know." and "Swonderful" played as a baiao are highly satisfying. Interesting jockey wax. Another of the many Pourcel creatively arranged space age easy/mood packages. From the back cover: For many years one of Hollywood's top musicians, Buddy Cole has been heard constantly on radio, television and recordings. His piano artistry is in constant demand among professional singers and musician, most recently as personal accompanist to Bing Crosby and Rosemary Clooney. Whether as a soloist, accompanist or orchestra pianist, his presence is frequently felt wherever music is heard. 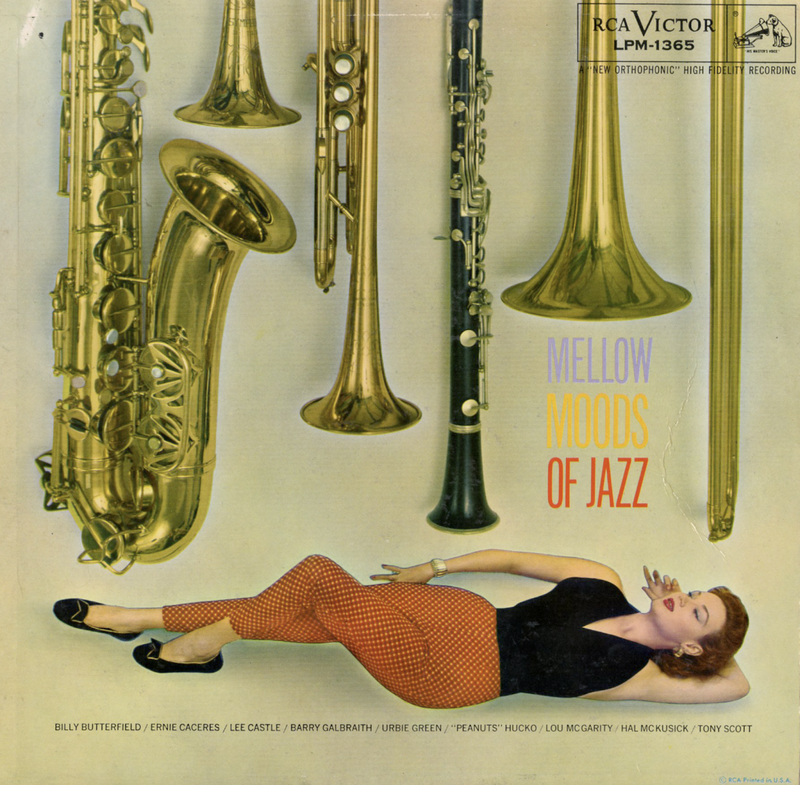 Large orchestra: Gene Orloff, Arnold Eides, Emanuel Green, Alvin Rudnitsky, Max Can, Anthony Zungolo, Norman Carr, Burt Fisch, Walter Trampler, and Seymour Barab, strings; Elaine Vito, harp; Leon Cohen, woodwinds; Ray Along, French horn; Hank Jones, piano; John Beal, bass; Osie Johnson, drums. 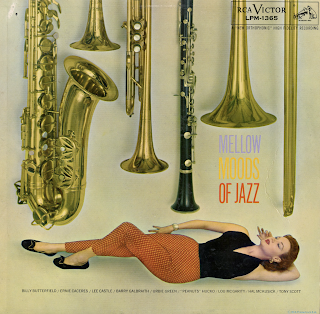 Woodwinds and horns: Joesph Soldo, Leon Cohen, and Philip Bodner, woodwinds; Ray Alonge, John Barrows, and Jim Buffington, French horns; Tommy Flanagan, piano; George Duvivier, bass; Charlie Persip, drums. 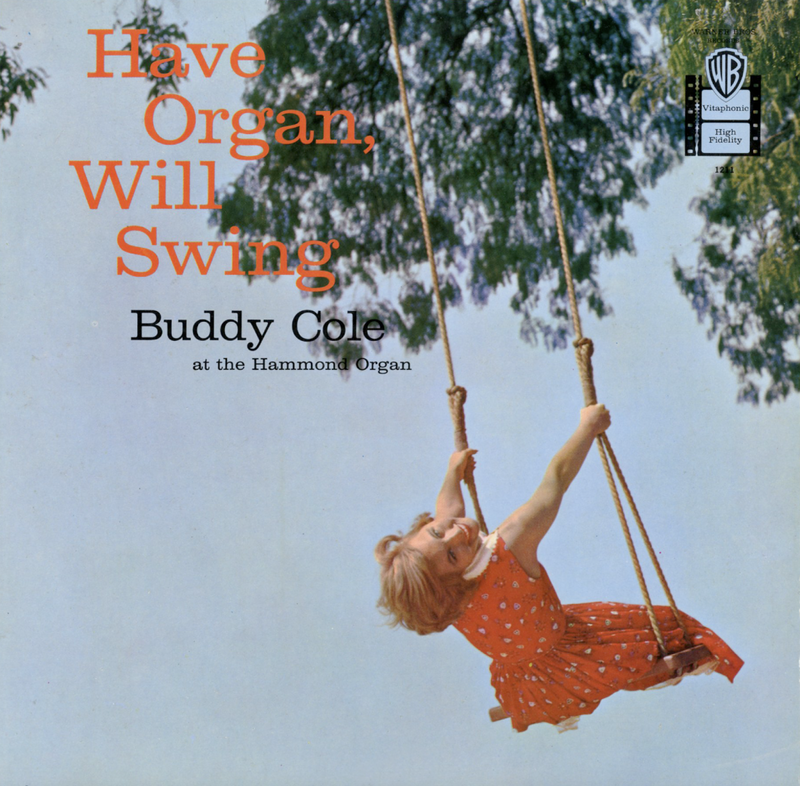 Brass ensemble:Burt Collins, Irv Markowitz, and Don Stratton, trumpets; Tom McIntosh and Freddie Zico, trombones; Ray Alonge and and Richard Berg, French horns; Don Butterfield, tuba; Torrie Zico, piano; George Duvivier, bass; Time Gillen, drums. 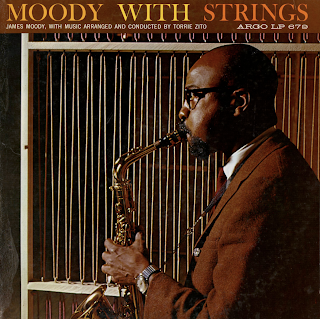 From Billboard - April 10, 1961: Reed man James Moody shows himself in a variety of moods and emotions here as he performs on tenor, alto and flute, from track to track, written by Torrie Zico in a manner which effectively showcases both Moody's lyrical and his swinging side. A listenable product, with backing ranging from lush strings to woodwinds and horns to a brass complement. 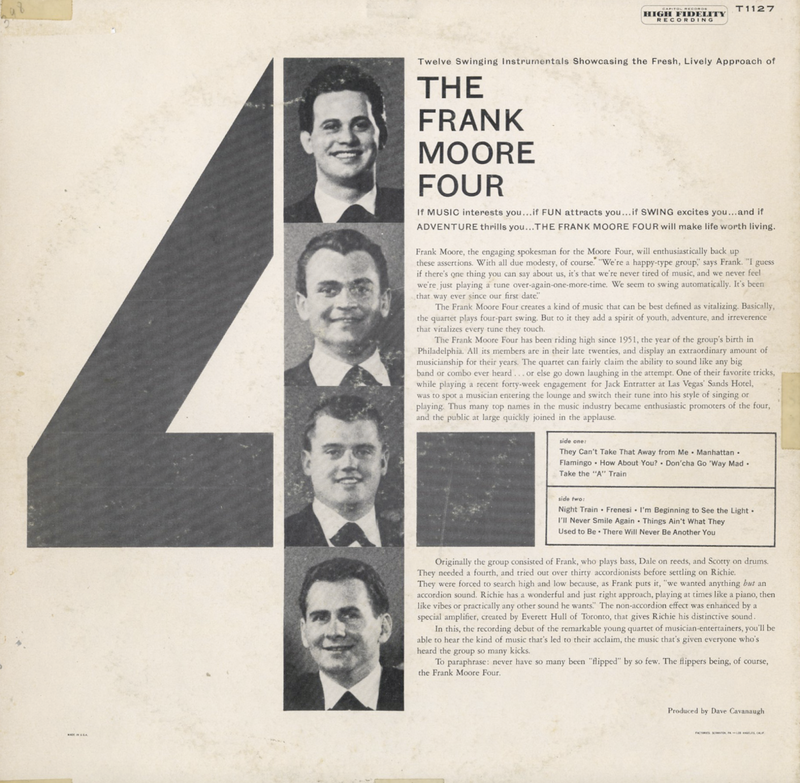 From Billboard - October 14, 1957: This album is somewhat more than the cover might imply. Not just a rehash of Hawaiian type dance music; it contains a number of interesting, authentic musical and rhythmic bits from Tahitian lore. Spots vocals, instrumentals and well-recorded percussion. Some spots are a good test for the hi-fi rig. 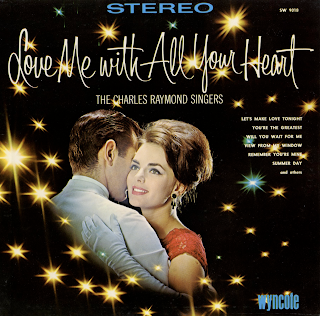 From Billboard - February 23, 1957: A "Save on Records" selection in December, this is a solid commercial entry. 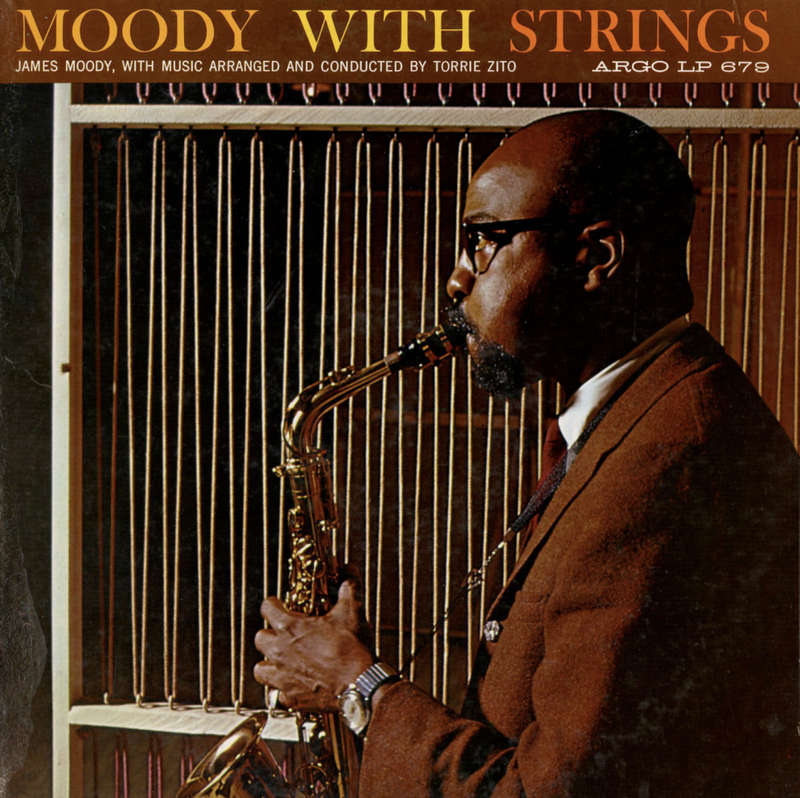 While this is a "background" or "mood" type LP, it is in a jazz context and anything but musically innocuous. 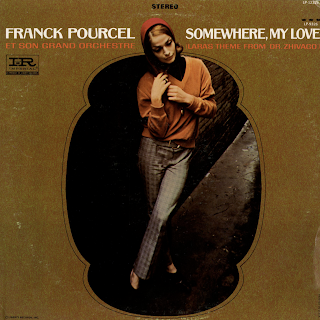 Three arrangers – Ralph Burns, George Siravo and Bill Stegmeyer – were given a big band for a session apiece and each produced some highly attractive settings for some lovely but neglected popular songs of the past. "Pastel Blue," which features he trombones of Urbie Green and Lou McGarity, would be a good demo band. The music is varied, but it is relaxed, melodic, danceable stuff that will have wide general appeal. From the back cover: The Frank Moore Four has been riding high since 1951, the year of the group's birth in Philadelphia. All its members are in their cage twenties, and display an extraordinary amount of musicianship for their years. The quartet can fairly claim the ability to sound like any big band or combo ever heard... or else go down laughing in the attempt. One of their favorite tricks, while playing a recent forty-week engagement for Jack Entratter at Las Vegas' Sands Hotel, was to spot a musical entering the lounge and switch their tune into his style of singing or playing. Thus many top names in the music industry became enthusiastic promoters of the four, and the public at large quickly joined in the applause. Originally the group consisted of Frank, who plays bass, Dale on reeds, and Scotty on drums. They needed a fourth, and tried out over thirty accordionists before settling on Richie. From Billboard - February 16, 1959: The group scores well with their first album effort on a lightly swinging series of tunes. Selections are nicely varied and the crew has an original, fresh sound. The LP can move in both pop and jazz marts if exposed. Fine, new talented group. The Shearing Quintet in fine form. The engineering is simple, as if a single mic might have been used to record the set. Sounds like you are sitting right next to Shearing while his quintet is playing a club date. From the back cover: George Albert Shearing was born totally blind in London, England on August 13, 1919. Studying piano by the Braille method at the Linden Lodge School for the Blind, he developed a solid classical technique and a lasting affection for Bach and Debussy. After graduating from Linden Lodge, he toured with a band of blind musicians, discovered jazz and settled into a solo piano career. During the War, he was featured with the Ambrose Orchestra, starred on his own B.B.C. radio show and wrote arrangements for top English bands. He was voted Britain's outstanding pianist for seven straight years in polls conducted by the Melody Maker, a leading English music publication. He paid America a brief professional visit in 1945 and two years later moved his wife and small daughter here to stay. His unique Bach-to-bop piano stylings were soon adding to the excitement on New York's 52nd Street. 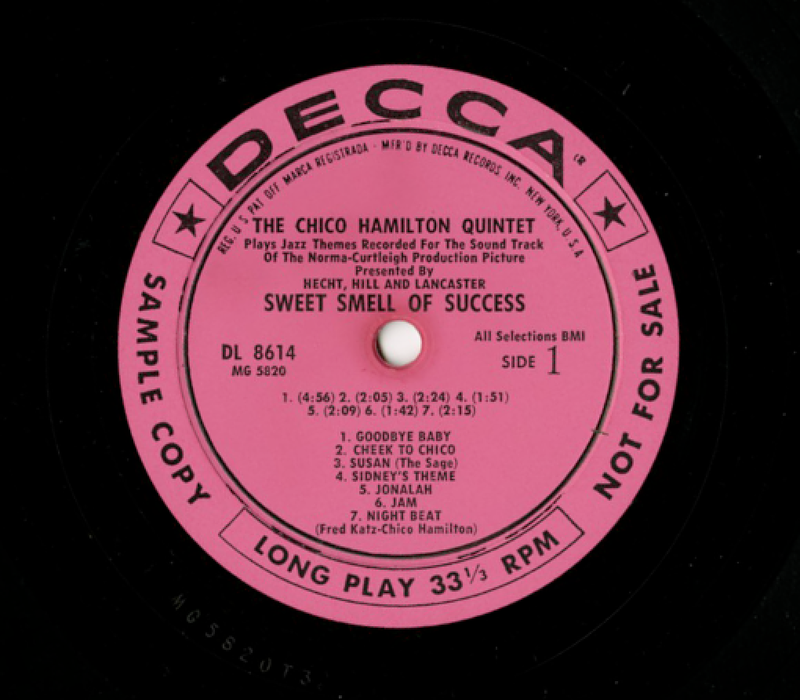 In 1949, a quartet (composed of piano, clarinet, bass and drums) with which he had been working was approached to make records. At the last moment, it was discovered that a previous contractual agreement prevented the clarinetist from playing the record date. George quickly put together a new group, substituting vibraphone and electric guitar for the clarinet. 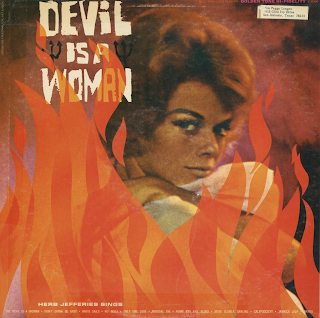 The group's first recording for MGM produced September In The Rain. It and the new "Shearing sound" were an overnight sensation. 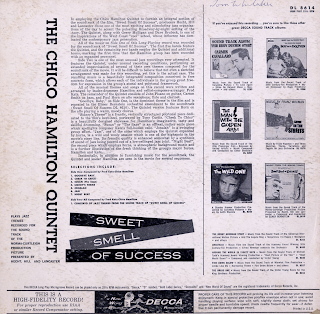 Nightclub, theater and concert offers poured in as the Quintet turned out hit after hit. The rest is history. 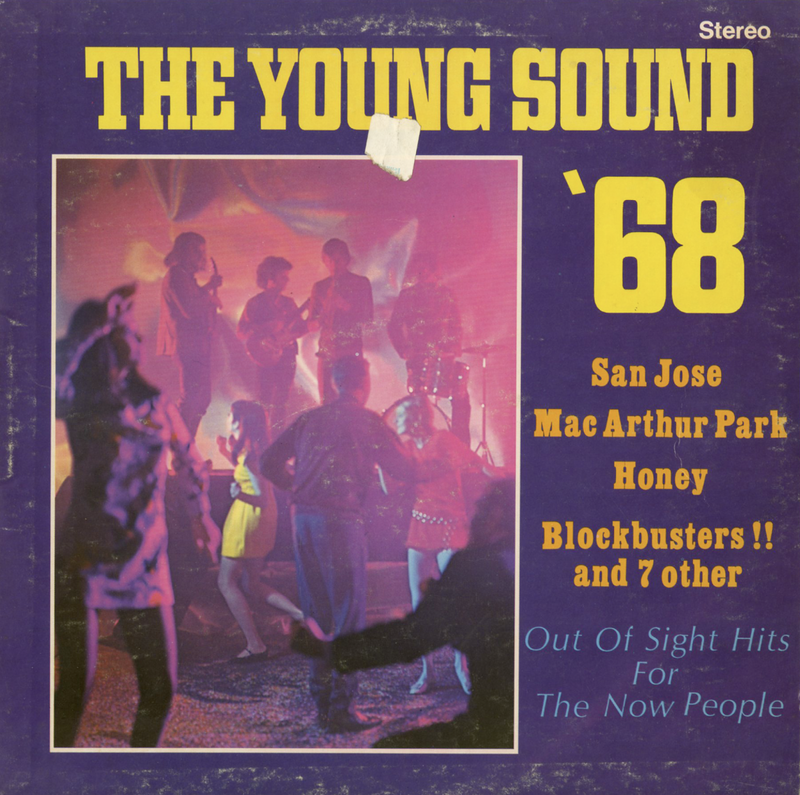 I collected this album for the cover art and was happy to discover an excellent late 50s mood package on disc. From the back cover: Enter now, the gifted young conductor-arranger, Elliot Lawrence, who has fashioned his own delightful recipe of music for romantic hunters on the chase. 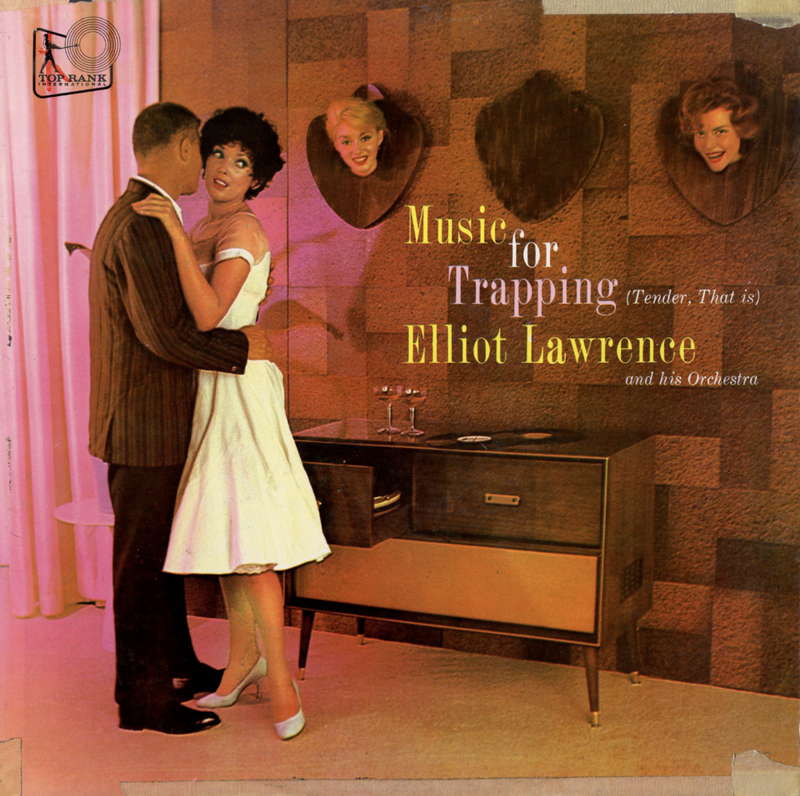 Here is a warm and appealing music for a mood, music with a classical foundation of massed strings, over which Lawrence has spread a creamy frosting of fine jazz-styled solos. 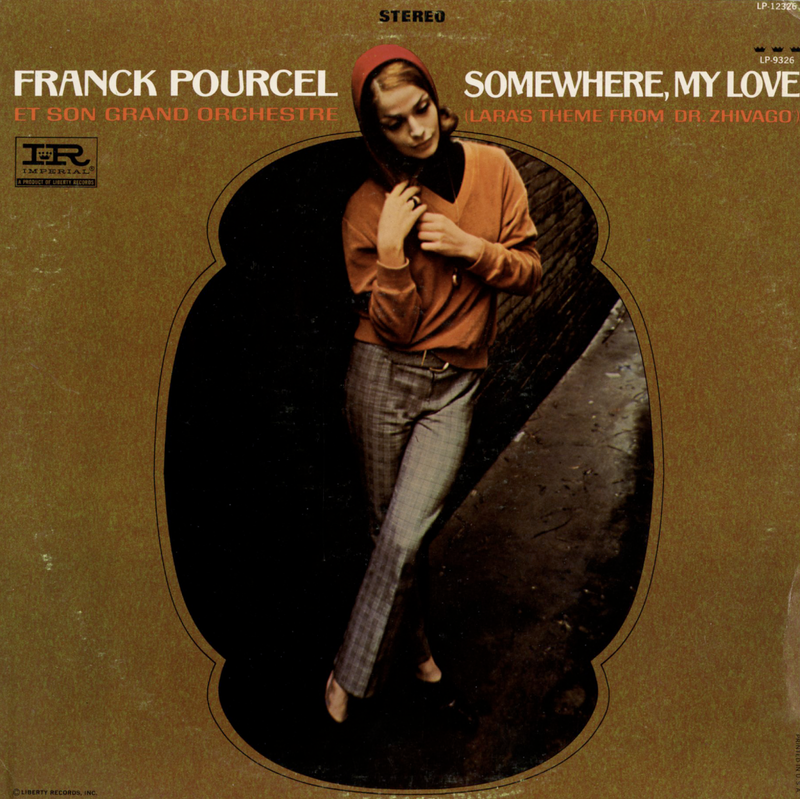 This is entirely in keeping with maestro Lawrence's own deep interest in classical music (he studied composition with Harl McDonald at the University of Pennsylvania and with Pierre Monteaux and Leon Brazin) and in Jazz. It was Elliot Lawerence, musical director at WCAU Radio in Philadelphia, a few years back, who developed a handsome new style of dance music. Such classically-associated instruments as the oboe, English horn, bassoon and French horn were used freely in his exciting dance arrangements. 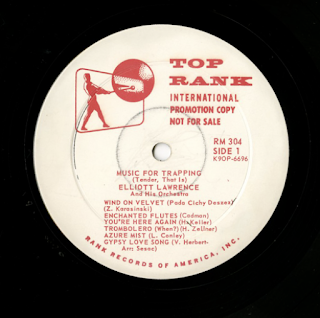 The success of this new sound eventually took Lawrence on the road for seven years with a band that became one of the top dance groups of its era. 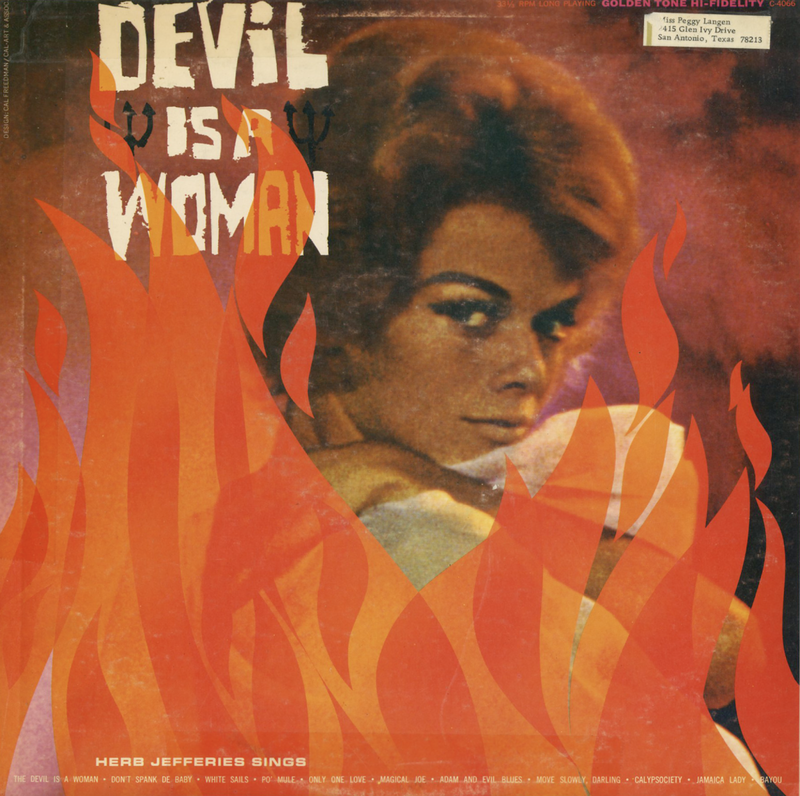 Later, Lawrence was music director for such radio and television programs as the Red Buttons Show, the Jim Backus Show, and Jazz Is My Beat with Jim Lowe. In the summer of 1959 Lawrence went to Moscow to direct an orchestra of 50 Russian musicians for a show being taped there by Ed Sullivan. 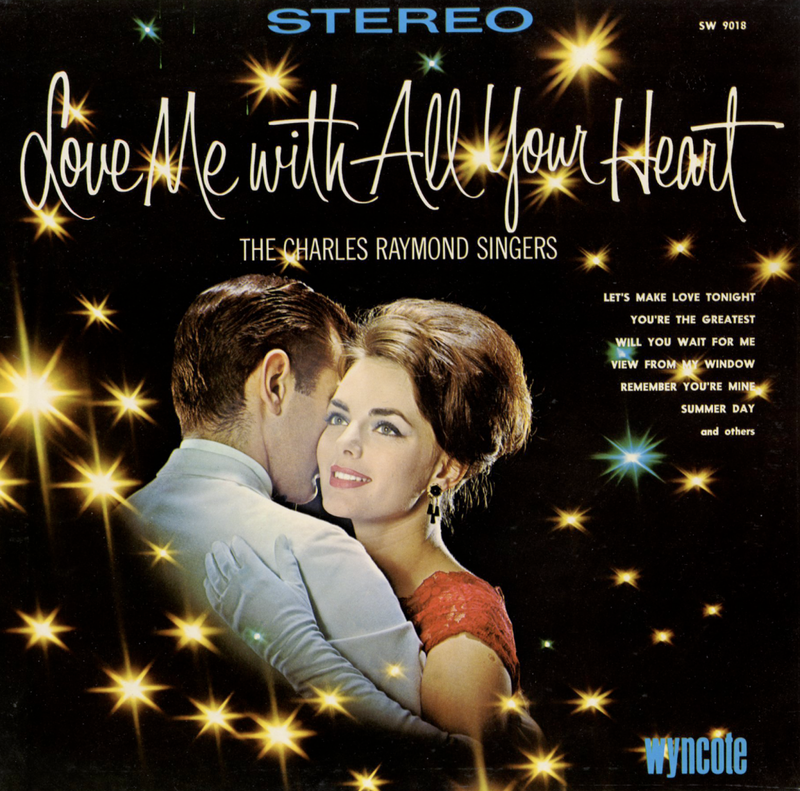 From Billboard - November 9, 1959: Here's a smooth, tender album of standard featuring warm, lush arrangements that should please many. 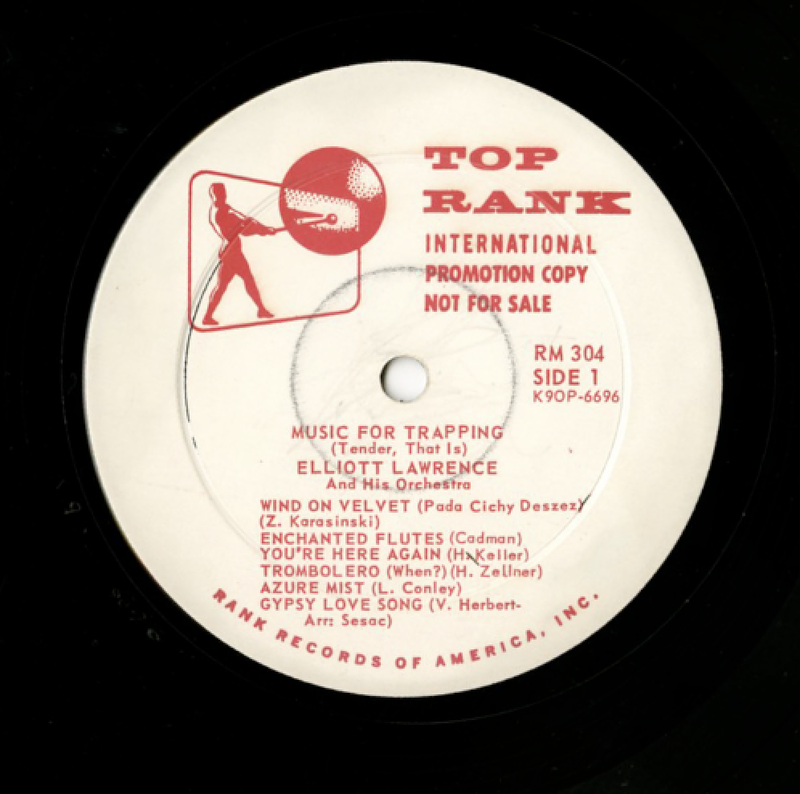 It spotlights the Elliot Lawrence Oak performing such tunes as "Shrine Of St. Cecilia," "So Little Time," and "None But The Lonely Heart," as well as attractive originals, with strings backing top jazz soloists including Zoot Sims, Urbie Green and Hal McKusick. Mighty god listening and excellent sound too, not to mention a mighty cute cover idea. Herb Jefferies managed to blend a variety of period musical forms including Broadway, soundtrack, calypso-island and crooner-lounge to create a bright, and as a complete package, a somewhat conceptual set. 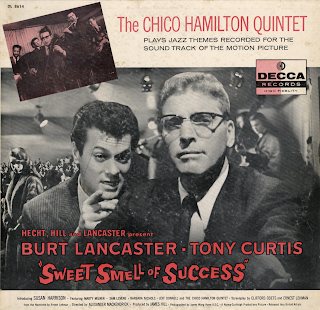 From the back cover: "Goodbye Baby," on Side One, is the dominant theme in the film and is repeated in the Elmer Bernstein orchestral amendment to the soundtrack (Sweet Smell Of Success DL 8610). 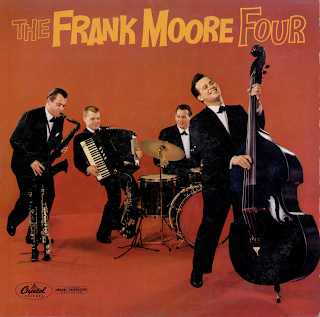 The Quintet version features Horn on the alto playing a warm, moody chorus. 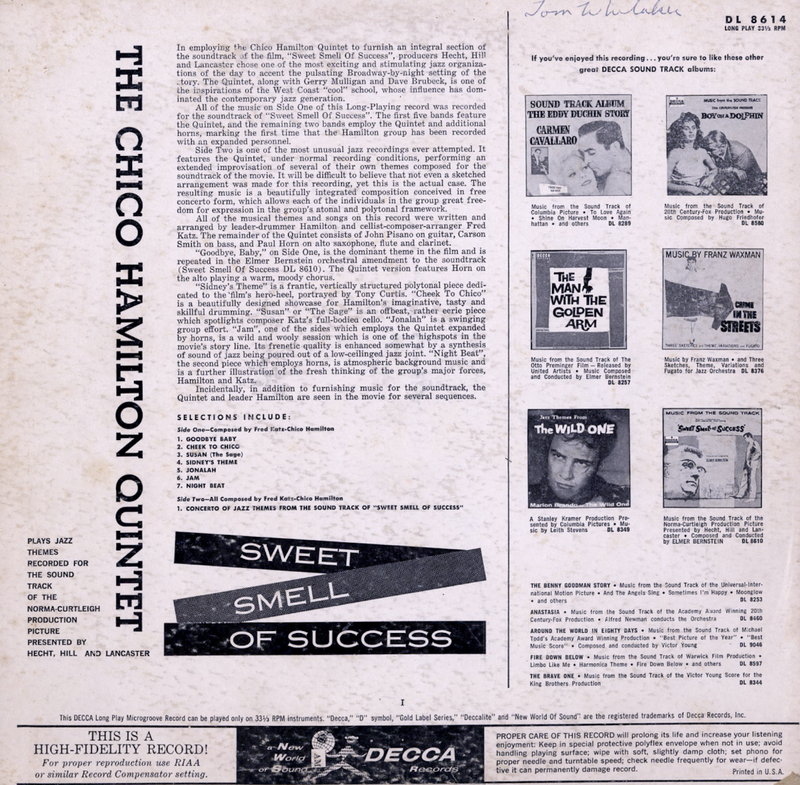 Incidentally, in addition to furnishing music for the soundtrack, the Quintet and leader Hamilton are seen in the movie for several sequences. 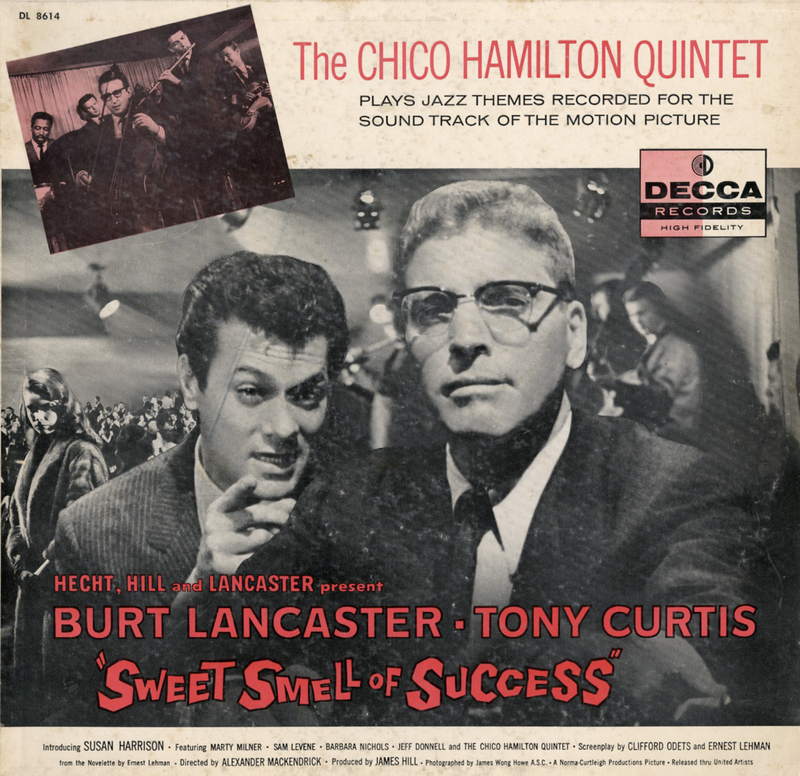 Concerto Of Jazz Themes From The Sound Track Of "Sweet Smell Of Success"
Out Of Sight Hits For The Now People! 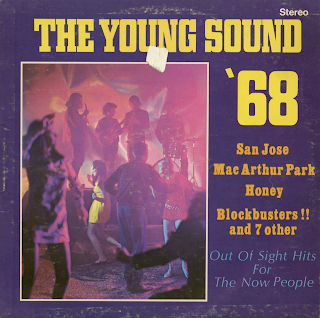 A compilation mix of lush strings, tunes that few kids living in 1968 might find "out of sight" and a few groovy tunes by The Animated Egg, Little Joe Curtis that are currently available from online vendors so I will not be posting the best "now people" track above. 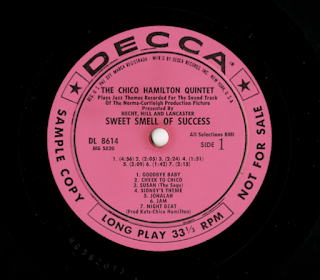 However, there is a nice guitar bridge buried in the selected sample, Guantanamera! Enjoy!